Fri., March 23, 2018, 5:25 a.m.
Anglers casting in Yellowstone National Park this season will have to leave their felt-soled wading boots at home. The park has banned the boots to help prevent transportation of aquatic invasive species. The park will also align its boating season with the fishing season – May 26 through Nov. 4. All watercraft to be used in the park are required to pass an AIS inspection. The inspections will be available seven days a week. The rule also applies to canoes, kayaks, paddleboards and float tubes. None of the three states surrounding Yellowstone outlaw felt-soled wading boots. An attempt to pass such a ban in Montana’s 2011 Legislature died in committee for lack of support. According to the Invasive Species Action Network, based in Livingston, Montana, the push to ban felt arose in 2008 after the foamy fabric was blamed for spreading a pestilent algae known as didymo, or rock snot, to streams across New Zealand. Idaho, Oregon, Maine and New Mexico – like Montana – also considered felt bans. Only six states now ban felt, as do Glacier National Park and the Blackfeet and Confederated Salish-Kootenai tribes. Vermont recently rescinded its ban after deciding it was ineffective, according to Bob Wiltshire, executive director of the Invasive Species Action Network. “I personally felt that most felt bans were ill advised when they were first implemented,” Wiltshire said. He said a muddy rubber-soled boot can move more invasive species than a cleaned felt boot. “The real risk reduction comes with cleaning,” he said. Wiltshire pointed to Alaska as a state with an unusual felt ban that applies to freshwater recreational anglers, but not waterfowl hunters. Felt-soled wading boots are meant to help anglers avoid slipping on rounded rocks commonly found in the mountain streams of states like Montana and Wyoming. Rubber-soled boots aren’t so forgiving, although manufacturers have devised different designs, and some even incorporate steel lugs – similar to cleated golf shoes – to help anglers keep their footing. Wyoming, in which the majority of Yellowstone National Park is contained, has no felt ban. State Game and Fish workers there typically wear studded boots, said Dave Zafft, fisheries management coordinator. Tom Woolf, who oversees AIS work for Montana Fish, Wildlife & Parks, agreed that regardless of what type of boot an angler wears, the key consideration is to clean, drain and dry all gear. In 2008, Trout Unlimited called on wader makers to eliminate felt-soled boots. The suggestion came after a 2007 study published by a Montana State University grad student showed felt trapped 100 percent of the whirling disease spores to which it was exposed. But the group’s opinion has changed since then. 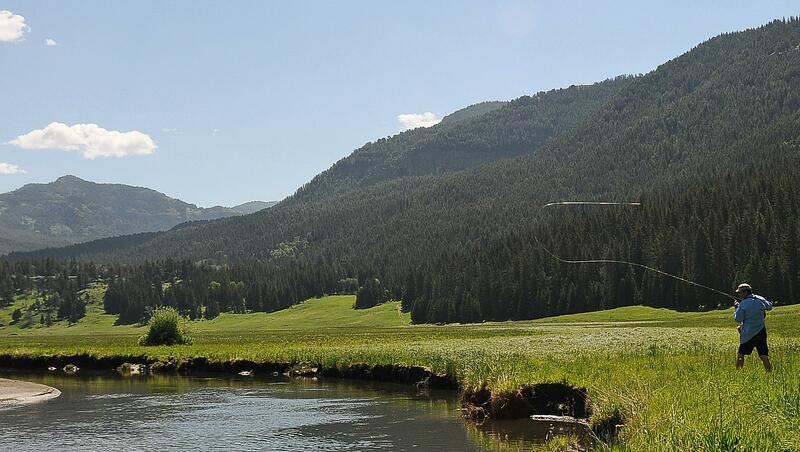 Montana Trout Unlimited hasn’t taken a stance on felt-soled boots, neither has the Cody chapter of TU in Wyoming, which is on the doorstep to Yellowstone’s East Entrance. Koel said Yellowstone fisheries workers use a bleach solution to disinfect their gear, but it dries out and shortens the lifespan of equipment. Yellowstone is not far from waters in Montana that have been infected with several invaders, including: New Zealand mudsnails; a naturally occurring parasite that has killed thousands of whitefish in the Yellowstone River; a pervasive algae known as didymo; and whirling disease, which significantly reduced wild trout numbers in the 1970s before subsiding. In 2016, Glacier National Park temporarily closed its lakes to boats after Montana reported detecting invasive quagga mussels in Tiber Reservoir and possibly Canyon Ferry. Alley said Glacier rangers “regularly have conversations with people fishing in the park to make sure they are aware of park regulations.” They also have issued warnings and citations for a variety of fishing related violations, including wearing felt soled waders. Published: March 23, 2018, 5:25 a.m.